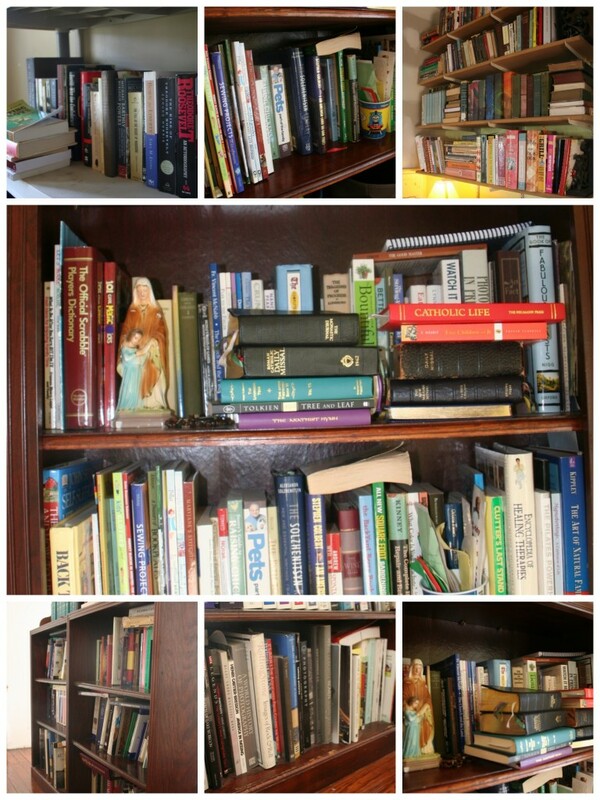 Anne is inviting her readers to share their bookshelves, and I couldn’t resist. 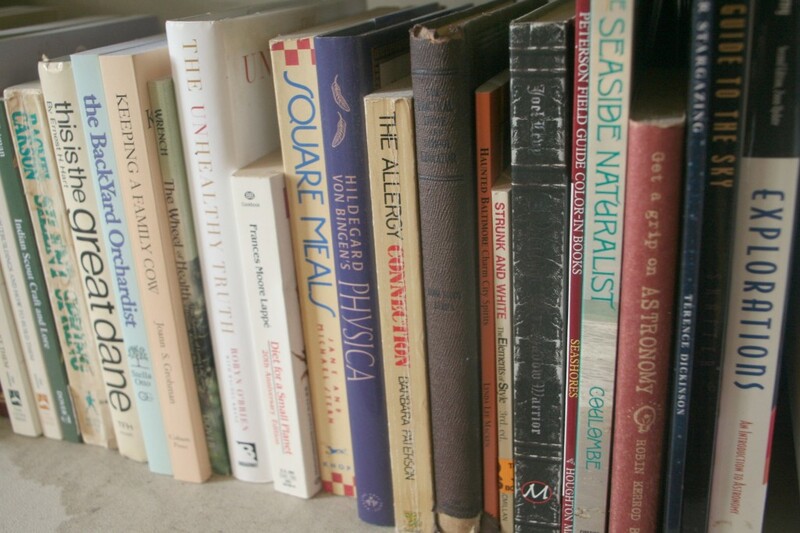 When I read her post about scanning the bookshelves in the homes she visited, I instinctively nodded along. I’ve scanned, and borrowed, many a favorite title from my closest acquaintances. And although I’ve tried to upload my library to Library Thing or Goodreads to share with others, I’m still drawn to the hardcopy and the experience of handling a new book for the first time in the den, living room or hallway of someone’s house and hearing them describe their feelings towards it. When people come over, if they don’t scan some of our shelves, I wonder if they’re just repulsed by our collection or immune to the allure of books, in which case, I worry we won’t have much to talk about. We have eight separate bookshelves spread around the house. Some are half books, half toys. Some are tall, some are wall mounted. The school books are hidden behind closed doors, thank goodness. Two make up our headboard. They are all in a state of disarray and are constantly being reorganized to accommodate more books. I try to keep books grouped by subject. 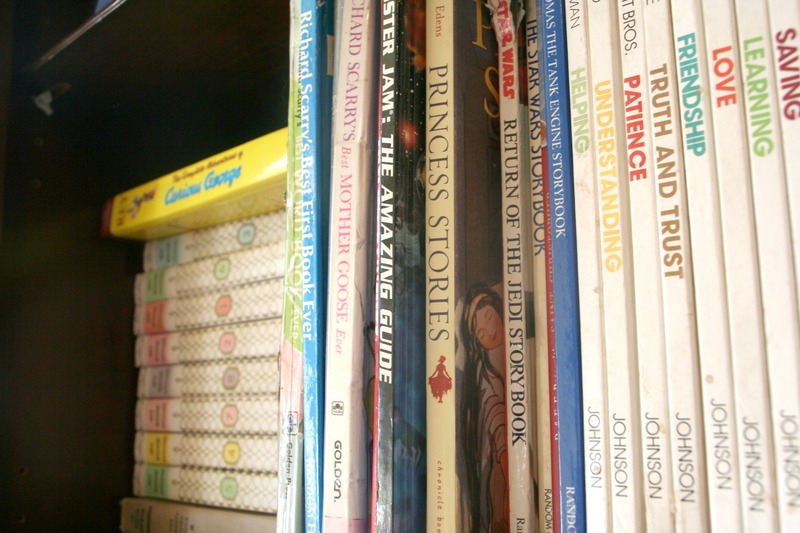 Kid’s books are divided by picture and youth between two shelves. (We also have those attractive rain gutter shelves I wrote about plus four boxes of books I’m slowly selling on Amazon tucked in a closet. And all the library books of course. I’m rereading this and I wonder if we need an intervention.) As a young unmarried couple, Tony and I thought it’d be nice to have a house with a dedicated library. Now we have a house that is a library in so many ways. Now some close-ups for your examination. I’m inviting you to be noisy; isn’t it great?? Downstairs, just above the picture books, we keep some collections and tall, oversized book, like the Richard Scary stories which are older than I, and have the tape to prove it. Plus most of the My Bookhouse series. On the opposite wall, the top shelf has become a dumping ground for religious books we grab on a regular basis. Plus the family story, currently ‘Five Children and It.’ Such is the way with deep shelves. And any space on top is also fair game for stacking additional homeless books. Stuck behind them are some of my favorite non-fiction titles including from ‘Eats, Shoots and Leaves’, ‘Better Off’, ‘The Complete Tightwad Gazette’ and several Catholic back-to-the-land books. Upstairs, we’ve erected some temporary plastic shelves. They’re hideous, and I’m pretty sure I apologized to each book as I agonizingly placed it there. On the bottom shelf, it’s a motley crew, but mostly non-fiction. We don’t reference these books often, but I can’t bear to part with them in the hopes the kids will one day develop interests in some of the topics, like that black ninja manual. To engage in more bookshelf snooping, be sure to visit the rest of the blogs linked up by at Modern Mrs. Darcy. Why not take some pictures of your shelves and link up too? I feel it’s only fair that you let me peak around your books now that I’ve let you see mine. How fun! Books are a huge weakness in our family. I followed your lead and linked up a photo of one of my bookshelves. LOVE IT that we both have The Value Tales on our shelves. Those are some of my most treasured from childhood and I’ve all but forced them onto my 2 kids. We live in a small apartment and I wish I had more room for books. I bet my 13 month old does too…he loves to empty them. I too have the same feeling when having to store books on the plastic shelves… especially as an adult! I know it “ain’t no thang” but it still feels wrong! Thanks for sharing! 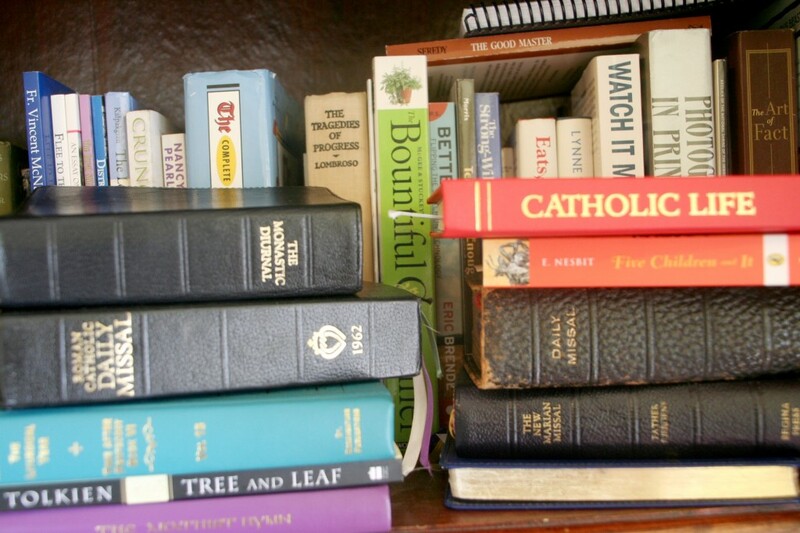 If you have a minute to mention titles of the Catholic back to the land books, I would love it – I didn’t know there was such a thing! Gladly. The Church and the Land by Fr. Vincent McNabb, The Rural Solution by various contributors, Flee to the Fields, The founding Papers of the Catholic Land Movement by various, and An Essay on the Restoration of Property by Hilare Belloc. Once you go down this path, you’ll start hearing the word “distributism” a lot. For more info, I recommend http://distributistreview.com/. You can also read through the Catholic Worker archives for great pieces from Dorothy Day and Peter Maurin on Catholic agrarianism. My first blog was dedicated to the back to the land and distributist perspective. I was so relieved, and excited, to find that the Catholic Church was promoting ‘small and local’ long before it was trendy. So if you have any other questions, feel free to drop me an email. I love how these look like they see some love on an everyday basis. AND I love the shout-out for Eats, Shoots, and Leaves–it’s one of my favorites! Your house is like a library? That sounds like a worthy aspiration for my own! Ack! I grew up with those value books!! I don’t think I’ve ever seen anyone else with them. I can still picture those little “soliders” inside the rabies vaccine. And Nellie Bly’s little squirrel friend.